With a stay at Comfort Inn Santa Cruz in Santa Cruz, you'll be in the business district and convenient to Town Clock and Santa Cruz Beach Boardwalk. 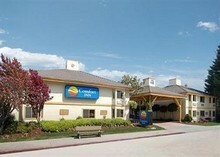 This hotel is within close proximity of Pasatiempo Golf Course and Cocoanut Grove. Make yourself at home in one of the 62 air-conditioned rooms featuring refrigerators and microwaves. Cable programming and DVD players are provided for your entertainment, while complimentary wireless Internet access keeps you connected. Conveniences include coffee/tea makers and irons/ironing boards, and housekeeping is provided daily.